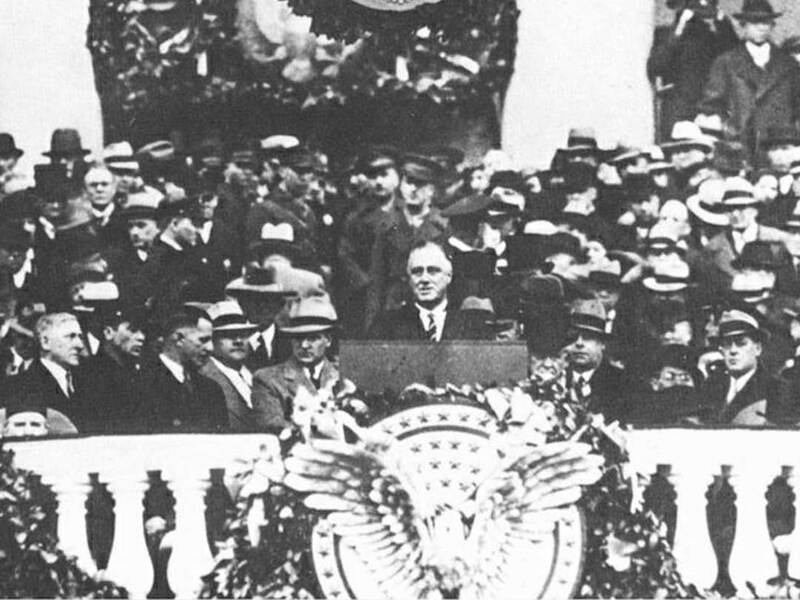 President Franklin D. Roosevelt’s Glass-Steagall Act was in force from 1933 to ca. 1995, and was repealed in 1999 after being deliberately unenforced by regulators for several years. It must be restored now: as a matter of justice for the terrific damages wreaked on American households and businesses by the 2008 financial crash; in order to prevent another, oncoming banking crash; and in order to restore the U.S. commercial banking system as an engine of bank credit through lending, which will contribute to a national recovery of industry, productivity and productive employment. Restoration of the Glass-Steagall Act now by the Trump Administration and Congress will almost certainly cause Glass-Steagall laws to be enacted in European countries, and thus contribute to recovery of the whole trans-Atlantic region, which has been condemned to near zero-growth and mass unemployment of younger generations. It will make possible bringing the “New Silk Road” dynamic rapidly into Europe and the United States. Is the Wall Street Casino Hurting the Economy? But over the more than eight years following the bank panic and financial crash of late 2008, the American banking system has only barely increased its lending to households and businesses, despite receiving a very large increase in deposits, and having some $14 trillion in liquidity from taxpayer institutions poured in by bailouts, more than $4 trillion of it permanently. Deposits have risen from $7.5 trillion in 2008 to $11 trillion in 2015, while the Federal Reserve put $4.5 trillion into the biggest banks by buying their securities; but loans and leases from the banks rose only from $7.3 trillion in 2008 to $8.3 trillion at the end of 2015, according to Federal Reserve data. The proportion of deposits going back out in loans and leases, shrank dramatically. And even that very small recovery in lending since the crash, has been due largely to the more than 6,000 community banks and major credit unions across the country. But the “Big 12” banks? “Trading” has been their watchword for profits, including with the bailout liquidity they got. “Trading” means the stock and bond markets, junk bonds and commodities trading, foreign exchange trading, “securitizing” everything from subprime mortgages to auto loans to home rents, repo markets, and of course creating “financial derivatives” bets on all of it. And the Wells Fargo account-fraud scandal showed something bigger. Right down to the retail level where branch bankers talk to customers, all the biggest banks are driving to put customers’ deposits directly into “financial products” including derivatives, rather than turning those deposits into loans to the U.S. economy. Glass-Steagall was passed in 1933 to stop this; and stop it, it did for more than 60 years, in which no major financial failure threatened to bring down other banks, or the whole banking system. Just a decade after Glass-Steagall was done away with in 1999, the collapse of Lehman Brothers spread through the whole financial system like a bomb. Already in 1998, the collapse of one large hedge fund, LTCM, nearly triggered a bank crash, because many big banks had lent that hedge fund $100 billion for derivatives speculations. 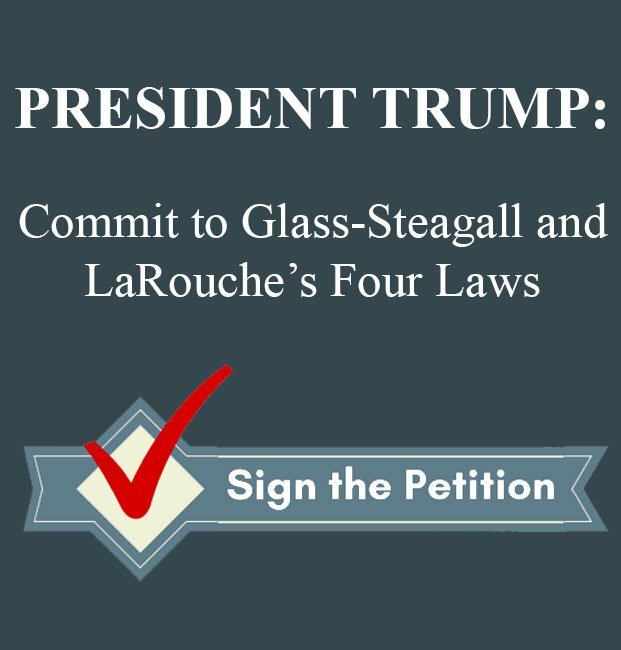 President Donald Trump and the 115th Congress must implement Glass-Steagall and LaRouche's Four Laws for an economic recovery. Sign our petition today. The U.S. Supreme Court, in a landmark 1971 decision on Glass-Steagall (Camp vs. Investment Company Institute), upheld the Congressional intent in Glass-Steagall to “protect commercial banks from the temptation” to throw deposits into high-risk, high-profit securities bets which, the Court said, could endanger the banks, their depositors and shareholders, and the economy. The conditions are now set for another financial crash, with even greater devastation of Americans’ livelihoods than that of September 2008—unless Glass-Steagall is re-enacted now, and enforced. How Dangerous Are the Too-Big-To-Fail Banks? Until Glass-Steagall was abandoned in the mid-1990s, there also were no U.S.-based “megabanks”; none held more than 6% of total assets in the banking system as a whole. From the late 1990s the largest Wall Street banks exploded in size, and this has continued since the 2008 crash, so that now just six banks hold two-thirds of the deposits and two-thirds of the assets in the entire banking system. So did their complexity: A New York Federal Reserve study in 2012 showed that whereas in 1995 the largest bank holding companies typically had 100 to at most 300 subsidiaries, by 2011 they each had 2,500-4,000 subsidiaries, vehicles for every manner of securities and derivatives speculation. The explosion of derivatives in the 1990s signaled the beginning of a doomed, self-feeding frenzy based not on investments and growth of the real economy, but purely speculative bets on its "performance.” Derivatives are essentially legalized gambling instruments which have hijacked the flow of investments into the real economy for short-term, private profit. 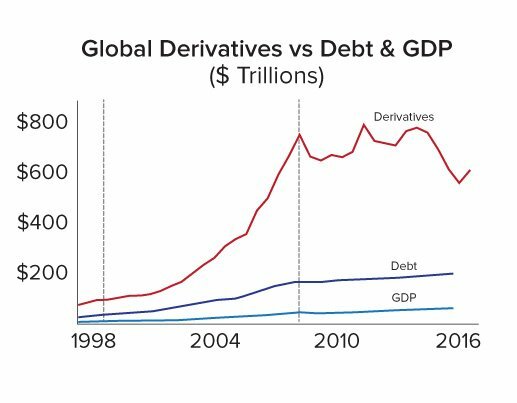 The derivatives markets exploded in size, from nominal values totaling about $70 trillion in 1998, to more than $700 trillion in 2008. The size of this derivatives market threatened to bring down all of the biggest banks at once, had the government not bailed most of them out. And after the crash, the six biggest Wall Street banks accumulated, on average, 30% more derivatives exposure, according to FDIC vice chairman Thomas Hoenig in 2014. That derivatives exposure was $232 trillion then; it is $265 trillion now. Most of the financial paper on Wall Street has no real value. For example, a derivative is a bet on the increase or decrease in the value of an asset, such as a commodity or bond, or on the change in value of a market index or currency. The current nominal value of global derivative over-the-counter “investments” is estimated by the Bank of International Settlements to be $544 trillion. The six largest U.S. banks hold a combined $265 trillion in financial derivatives, while the U.S. GDP is in the range of $21 trillion. That means the derivative debt is about 12 times the nominal value of the entire U.S. economy! If the entire economic output of the U.S. were enlisted to pay up on those bets it would not succeed. However, since a derivative debt is nothing but a gambling bet, that enormous amount of financial paper doesn’t need to be protected. It can be cancelled, by simply reinstating the Glass-Steagall separation of federally-insured and regulated banks, which would provide the basis to take those gambling bets off of any federal insurance. The nominal “value” of the risky investments of the investment banks—now separated from the deposits of the commercial banking system, from government insurance, and from an implied government guarantee of a bailout—would rapidly evaporate. These institutions could then safely be allowed to declare bankruptcy, under which debts could be written off as part of reorganization. Since 2008, the indebtedness of the systemically important financial institutions has only grown, while the measures taken to address the collapse have made the system even more bankrupt, creating a situation where the rest of the economy collapses at an increasing rate to keep up. The $14 trillion “eased” into the system to keep the “globally systemic” banks afloat went to purchase toxic assets of the financial institutions and create stock market and other financial bubbles. Much of the money loaned went straight into these bubbles. Much of the $4.5 trillion created by the Fed to buy banks’ securities, was put back into the Federal Reserve by those banks as interest-earning “excess bank reserves,” never touching the real economy. When the derivatives bubble burst in 2007, the Fed and ECB stepped in to bail the speculators out. 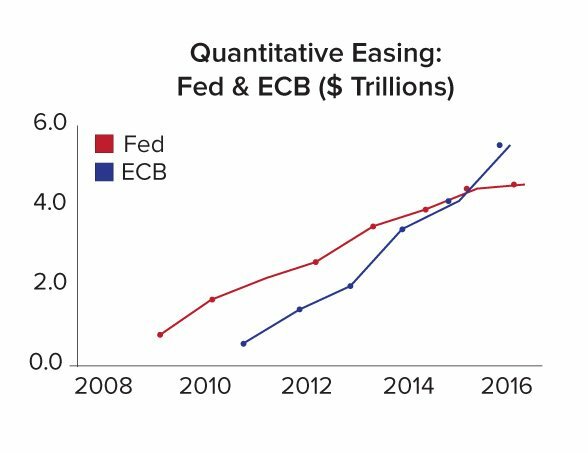 After seven years of QE, at the point the Fed could no longer continue its frenetic 2013 pace of $1 trillion in a single year, the ECB stepped in and has continued to pump trillions of dollars of QE into the bankrupt trans-Atlantic banking system. Today, those same biggest banks are still wildly over leveraged. The twelve biggest U.S.-based banks have an average “leverage ratio”—the ratio of their capital to the assets they claim—of about 20:1, a big “improvement” from 2007, when it was 30:1! But the rest of the banking system—all the community banks and regional banks—have a leverage ratio of only 6:1. And the big banks calculate the “value” of their assets by their own internal computer models, since so many of their securities assets don’t have a market sale value. This is particularly true of derivatives: For example, the Supervisory Committee of the Europe an Central Bank has just admitted to the European Parliament, that it cannot assess the risk, nor the value, of the derivatives held by the biggest European banks, with the largest being Deutsche Bank. The interconnectedness of financial institutions over various national borders and sectors of the economy means that a crash in one region, will ignite a meltdown in the whole system. A recent report from the Office of Financial Research, a unit of the U.S. Treasury, showed that the largest U.S. banks are tied to the gambling exposure of European banks with $2 trillion in mutual investments, and are also liable to cover $2 trillion in derivatives purchased by U.S. life insurance companies. This is just one example of how a crisis anywhere in the trans-Atlantic system, whether in the quaking big banks of Europe, in the United States, or any financial sector, will cause a chain-reaction collapse in the whole. After receiving “financial assistance” in the form of quantitative easing or “asset purchases” by central banks, these gigantic, “systemically important” financial institutions offload investments of all qualities back to their central banks as collateral to borrow liquidity, allowing them to hide their losses. Despite this, many banks, like Morgan Stanley, Deutsche Bank and Santander, have not passed the “stress tests” performed in the United States or Europe. The supposed “value” of these assets cannot be maintained; it is systemically important to put them through the bankruptcy organization made possible by Glass-Steagall. As the introduction to the original Glass-Steagall bill stated, the intention was “to provide for the safer and more effective use of the assets of banks, to regulate interbank control, and to prevent undue diversions of funds into speculative operations, and for other purposes.” Investment banks were forced to completely separate their activities from commercial banks, and since only commercial banks were federally insured, the speculative holdings made by non-banks were not, and their fictitious “assets” could now be written off. More importantly though, was the greater conception encompassing Glass-Steagall known to Franklin Roosevelt, that the physical productivity of the nation, in food production, transportation, and technology levels, per person and per unit of land, was the absolute primary concern, and had to remain free from all aspects of financial manipulations by Wall Street entities that could endanger them. Any financial system requires a constant source of new monetary input derived from the real economy, as the creation of new financial wealth without a corresponding increase of physical productivity would be fictitious. With the rate of collapse of physical production in western countries over recent decades, while the physical profits of the people have been looted and no reinvestment into the national platform of physical production made, the effect has been a multi-layered crisis of unemployment, moral decay, increased death rates and lower life expectancy. 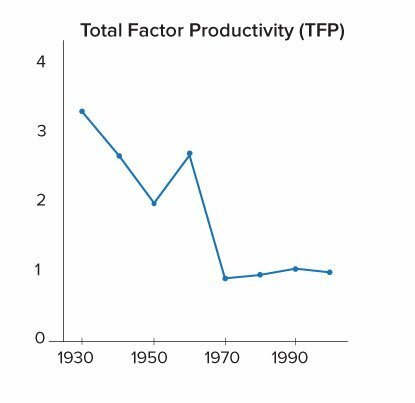 Total factor productivity (TFP) measures the rate of growth of an economy due to technological advance, rather than the simple application of more labor and / or capital. The highest rate of growth of TFP in U.S. history, was its 3.30% annual rate of growth in the 30s, under FDR's New Deal & Four Corners infrastructure programs. The financial system, as a result of this policy, has become the largest financial bubble in human history. This bubble is endangering the lives of our children, elderly, sick, and poor, yet still the political leadership needed to stand up to Wall Street and protect the real economy from the financial meltdown has not been taken. Every American has personally witnessed heartbreaking examples of this. Why Hasn’t Glass-Steagall Been Implemented? The restoration of Glass-Steagall has ample public support, as indicated by the bills introduced into Congress calling for its reinstatement, state assembly resolutions introduced or passed in over 30 states, support in both the Democratic and Republican Party platforms in 2016, voter petitions signed by at least 400,000 Americans, and public statements of support by leading financial figures. So why hasn’t it been implemented? Glass-Steagall regulation is the stake through the heart of Wall Street, and the big banks and their institutes have spent massively to get it repealed, and to corrupt and threaten those at both the Federal and state government level in order to prevent it from being restored. But the lack of scientific thought has crippled the general public and institutional comprehension of the principles of physical economics. Viewed from a monetarist standpoint, speculation is not perceived as evil, but as a necessary tool, as indicated when financial spokespersons defend derivatives or other speculation as necessary, to “hedge” their investments and provide “investment security.” In actuality, derivatives almost invariably damage the financial security of most of the cities, states, businesses, and even banks which enter into them; and just as often, they have been used by the megabanks to rig markets, interest rates, foreign exchange values, prices, and contracts. These financial “experts” are likely as ignorant of the principles of physical economics as are most Congressmen. In truth, the security of an investment is determined by the science of the investment: whether, by being made, it creates a greater means for increased physical productivity to occur. This was clearly developed in the policy papers of Alexander Hamilton presented to Congress as first Treasury Secretary of the United States, over the years 1790-1791, and brought to the current in LaRouche’s Four Economic Laws. Some hundreds of billions in fines by U.S. authorities alone since 2010, prove that the too-big-to-fail Wall Street banks—despite the crash, and despite the Dodd-Frank Act—have continued to rely on illegal and/or immoral actions, rigging of markets, mortgage securities fraud, deceitful cross-selling of financial products to customers. The Federal Reserve itself recently (in October 2016) issued a letter to the financial committees recommending that Congress forbid commercial banks from owning commodities, managing commodities infrastructure, and merchant banking—all prohibitions which restoring Glass-Steagall would accomplish. There is no substitute for prosecuting the top executives of the major Wall Street banks for the endless catalog of criminal actions they’ve been exposed as engaging in—fines, even large fines, do not reduce these banks’ political power. But restoring Glass-Steagall would definitely reduce their power. It would lead to the removal of the managements of many of the biggest bank holding companies, whose holdings would be broken up under Glass-Steagall. Secondly, many of the speculative units of these huge banks will go under, once the commercial banking units, holding $12 trillion in savings deposits, can no longer be used to support them because of Glass-Steagall separation. Many people believe today that Wall Street itself is something necessary. What has Wall Street ever produced for the real economy? Join our campaign! Sign up for regular updates.